River cruises versus large ship cruises. Last week I wrote an article of “Me versus the internet”. Well this week my article is “River cruises versus large ship cruises”. So many times I try to convince people to try a river cruise. The main reason is that they constantly complain that the itineraries of the big cruise lines do the same old thing, or that the ships are too big, with too many people, the lines are long, and they nickel and dime you all day long. Well folks it doesn’t have to be that way. What I try to tell people is that you need to look at the overall big picture of a river cruise. That means knowing ALL the extras that are included. Not only is it nice to have these extras included, it also makes your vacation more relaxing and enjoyable. So if you are tired of 800 unruly kids running all over the ship, or waiting in long buffet lines because somebody can’t decide on which tomato slice to choose from or if you’re tired of the constant peddling and nickel and diming of the cruise then don’t do it anymore !!!! These river cruises don’t cost that much more than your typical Princess or Celebrity cruise line. 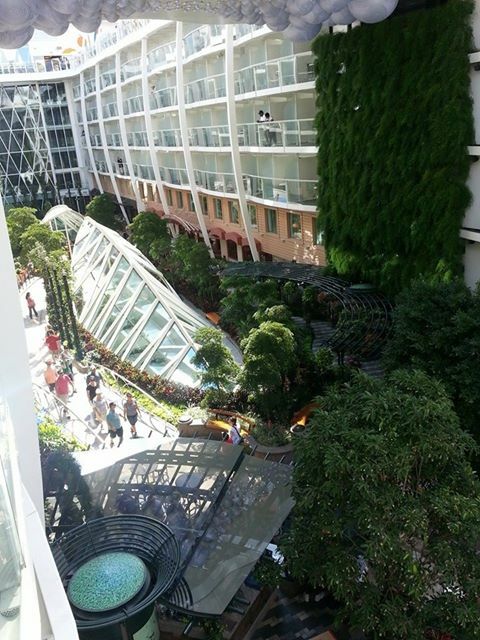 Plus the overall cruise experience is so much better. A river cruise is a destination-orientated, immersive and culturally-rich experience. These ships sail right into port and drop you off just steps away from all the attractions filled with history. The destinations are really the heart of this product. 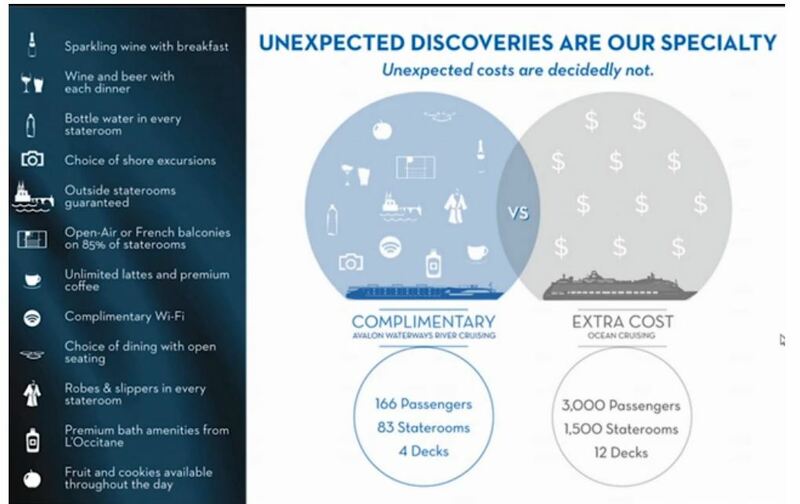 Some of the inclusions include shore excursions in every port, specialty coffees and teas, bottled water, sodas, wine and beer for dinner (and sometimes lunch too), free wi-fi, wine and cheese tastings and more. Your bags won’t be confiscated and you won’t have to go through x-ray machines if you would like to buy a bottle of wine in port to enjoy while on the cruise. Most of the ships hold less than 200 passengers which means they are smaller intimate ships with spacious rooms and every cabin has a window for the daily changing river view. And since you are slowly cruising on a river there is no such thing as sea- sickness. With less than 200 people onboard there are never longs anywhere, especially during the embarkation and disembarkation process. River cruises have a 99.6% average passenger satisfaction level. That is huge !!!! And did you know that 80% of people who have taken a river cruise have taken a large ship cruise in the past. So I urge all of you to expand your horizons and graduate to the next tier of cruising. River cruising is the in-vogue travel trend, so popular that more than two-dozen new river ships will debut in 2014. Industry-leading Viking River Cruises alone will christen 14 ships in March, with Avalon Waterways,AmaWaterways, and Uniworld. Closer to home, American Queen Steamboat Company is debuting a sternwheeler on the Columbia & Snake rivers in the Pacific Northwest in addition to its cruises on the Mississippi. American Cruise Lines operates similar routes. Here are the best reasons to take a river cruise. River cruises get you to inland Bucket List places including such cities as Vienna and Budapest. Cruises on the Danube and Rhine continue to be the epicenter of the industry, but that’s just the beginning of where you can go. Popular destinations include Russia’s Volga, China’s Yangtze, the Mekong and the Mississippi. All the rage is cruising in Myanmar — with companies including AmaWaterways and Orient Express. France is getting new attention, especially Bordeaux where several lines have expanded offerings. There is opportunity shipboard to snack on knockwurst and drink local beer as you cruise past Germany’s castles, drink the wine in Bordeaux and try other local flavors depending on your itinerary. Culture comes onboard, too, in the form of local folk groups and other performers. With almost 18 years in this business I offer much more than just quoting a price. A trained monkey can point out a price on a computer screen to you. With all the years that I have been in this business, the 70+ cruises I have been on with all different lines, and all the destinations I have traveled to, you will get much more than that from me. Do you want to book your vacation with someone who sits behind a desk and has never been to the location that you are interested in? Or with a person who has never been on the cruise line or the ship you are considering spending your valuable money on? Or do you want to deal with someone that spends their own time, money and effort to travel to these destinations to learn all about them? Go to the customer service tab on our home page and spend some time reading our “clients testimonials” and “qualifications”. After you do you won’t ask me what can you do for me that the internet can’t do?